The first product I will be testing from the Influenster Rose VoxBox is, Lindt LINDOR Truffles. Smooth, melting, luscious. When you break the shell of a LINDOR truffle, the irresistible smooth filling starts to melt and so will you. Available in 10 smooth, melting flavors! Talk about heaven. And YES, they are addicting! Very smooth and creamy. The chocolate is rich but not over powering. I'm a big chocolate fan and these are by far one of my favorites. They are just the right size to satisfy your craving. And, Compared to most other good tasting truffles, they can be found at a grocery store at a cheap price! I have to agree there are never enough in the bag! These truffles are GOOD. 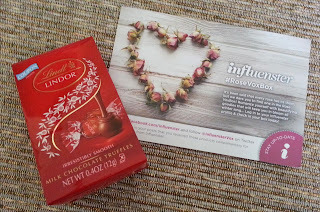 Sadly, I didn't get a chance to try the ones I received in my Rose VoxBox - my husband snagged them first. ;) I'm glad you had the chance to enjoy them!